In another a few more hours (13 hours to be exact), its going to be 2012. What have you achieved this year and was it good or bad? 2. Participated and got prizes (money) for Olympic distance triathlon. 2nd place in ABDB triathlon (local race) and 15th place in the age category Sarawak International Triathlon. 3. 2nd time competing in Powerman Malaysia (the last time was in 2008) and hoping to break sub 4 hours but only managed to reduce 2 minutes of my previous time. 4. 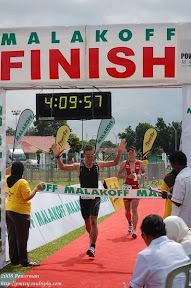 1 month after that, competing in Brunei first ever Duathlon and I got 13th place out of 50 individual participants. 5. Participated in a few running races such as 5km youth run, national day run, SCB charity run, SOSRO run, Larian Hari Keputeraan, Tasek Climbathon, HSBC Walk Run Cycle, UBD Convo run and etc. 6. Participated in Borneo Marathon – 21km category and did not managed to break my 21km record. That was the only international run that I’ve participated. 7. Did 2 cycling road race and wasn’t very proud of my results. All of it I was in the back peloton. 8. Participated in Telbru Team Time Trial road race and I was very happy with my performance even though our team did not managed to achieved our target of getting top 5 or 6. We got 8th place. 9. My other sports: Ultimate frisbee. Did 3 tournaments. KK Ultimate Hat, KB Ultimate and Andi’s Tourni. Formed a new team under the name UIA (UBD-ITB-Anakpanyu). Managed to get 4th and 5th place in KB Ultimate and 3rd place in Andi’s Tourni. It has been a very exciting year and hopefully next year will be a more challenging year – planning to join Ironman distance triathlon.